Ok, no surprise the Putin puppets, coal worshippers and wind baggers in the Trump administration have levied a 30 percent tariff on imported solar panels. While I don’t blame vampires for resisting being dragged into the sunlight, think about it this way guys, at least you’ll be free of those chains. There’s a lot of handwringing going on, but remember, solar modules – imports of which are now subject to the a 30% tariff – represent only a fraction of the total cost of installing solar panels. A little perspective in order, which I found on this twitter thread from Ramez Naam. Trump today imposed 30% tariffs on silicon solar panels imported into the US. This is dumb and avaricious, and will hurt the solar industry in the US. But, at most, it’s a temporary speed-bump. Here’s why. 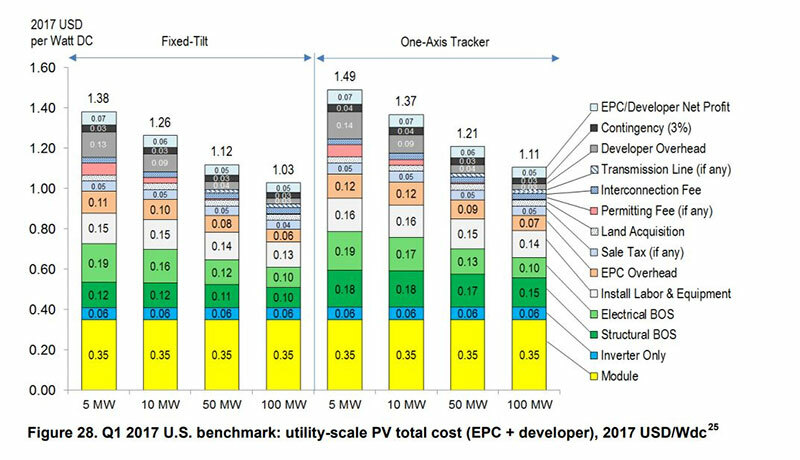 Today, at utility scale (how most solar is deployed), solar modules make up around 1/3 of the total system cost. The rest is so-called “soft costs” – framing, land, labor, trackers, inverters, wiring, etc.. Raising the cost of modules by 30% raises total cost maybe 10%. A 10% cost increase puts the total cost of utility-scale silicon solar in the US… back to where it was in late 2015 or early 2016. At current pace of cost reduction, in another 1.5 years, costs will be back down to where they were last month. This tariff only applies to *silicon* solar panels. It does not apply to the thin film panels that the #1 US solar developer, First Solar, uses. First Solar will see no rise in their prices. Expect them to gain market share. That’s why their stock is up tonight. Utility scale solar is ~70% of US solar, so that’s what I’ve talked about first. But at commercial/industrial and residential scales, this matters even less. At residential scale, panels are maybe 1/8th or 1/10th of total price. This tariff will raise prices by a few %. None of this is to voice even the tiniest bit of support for Trump’s move on tariffs. It’s stupid, job destroying, bad for the planet, etc.. We need to be moving faster, not slower. It will cause real damage to the solar industry for a couple years. But it won’t stop solar. So, big picture, the unstoppable renewable revolution has a succinct reply to the fossil fuel troglodytes. With all the shenanigans around trade language (“should a tiger-shaped pillow be taxed as a toy or as bedding?”), savvy importers might instead import “energy collection modules” which have solar panels built in. Draw a smiley face on them and call them artworks. President Trump’s decision to impose a 30 percent tariff on solar imports could cost the solar industry 23,000 jobs in 2018, according to the Solar Energy Industries Association, because most U.S. solar manufacturing is centred around making parts for cheaper imported panels. Super, Donald, keep on shovelling… your own fecking grave!